We’re excited to offer a few brand new services! Vita Vie Retreat is now offering fitness classes on the beach in Delray Beach, Florida (Palm Beach County). In an effort to reach our local community, we’ll be offering a few classes at the south end of the beach by the Seagate Beach Club to local residents and visitors. Whether you live in the area or are staying with The Seagate Hotel & Spa, we’d love to have you out for a beachside workout! We’ve been using the beach for our fitness retreat programs since 2006 and it’s one of our best assets. Our guests generally comment on those workouts being some of their best memories. Ocean views and fresh breezes can’t be beat when you’re working out. It sure puts a sweaty gym to shame! Plus, when you workout on the beach, you’ll get the benefit of burning up to 50% more calories. Because working out in the soft sand requires you to use so many more muscles, the result is a workout that is more challenging for the body and mind. We’ll be starting with a light schedule and will increase our class schedule as we see fit. The current weekly schedule of classes is listed below. If there is a class time that you would prefer to see, please send your request to retreats@bvretreat.com. We’d love to accommodate as much as we can for our local program! Class Description: This high energy class is a straight up, cardio conditioning class that will have your heart pumping and your muscles burning! Full of cone drills, foot work, speed work and agility movements, this is an interval style class that will torch calories and elevate your metabolism even after the workout is finished. Levels: All levels welcome. Modifications offered for all fitness levels. Bring: Water, a full sized beach towel and a sweat towel. All other equipment provided. Where: Session is on the beach and meets by Delray Water Sports across from Anchor Park. Please be prompt (a few minutes early is great)! RSVP: Required. lease send an email to retreats@bvretreat.com if you would like to attend. Class Description: Based on our signature beach boot camp class at the retreat, this is a full body workout that will incorporate strength, cardio, balance and core. You’ll get your heart rate up, challenge your body and get to enjoy the gorgeous ocean views as you sweat and move with us. Levels: All levels. Modifications will be offered for varying fitness levels. Bring: Full size beach towel and water. Sweat towel is optional to bring if you need one. Where: Class is held on the beach. Please meet at Delray Water Sports next to Seagate Beach Club. RSVP: Required. Please send an email to retreats@bvretreat.com if you would like to attend. This is a lower impact class that begins with a light dynamic warm up, blends bodyweight strength, balance, a little bit of cardio in the middle and finishes up with dynamic flexibility and/or static stretching. We’ll get your heart pumping a little, challenge your muscles and have you feeling stretched and released all by the end of this hour long class. Bring: Please bring water and a sweat towel. Cost: $15 Cash or Credit Card on site. Foot & Ankle Strength – One of the main reasons why we “roll” an ankle is because of weakness. As a whole, we rarely walk or train on uneven surfaces anymore. Years ago, we walked on uneven ground that incorporated varying obstacles. In 2019, we travel by foot on paved roads and sidewalks and even walk on finished floors most of the time. Unfortunately, this doesn’t benefit our foot and ankle strength. Working out on the beach is a great way to strengthen those parts of the body and the sand provides a little give to the workout surface making it a little less impact. Core + Balance – Because the beach and the soft sand is also challenging, you’ll be recruiting your core to help you workout. This will help challenge your core strength. In addition, as I said above, you’ll be strengthening your foot and ankle strength which will also help your balance. Not only that, but working out on a surface that is uneven helps improve the mind body connection. Your brain will have to work harder to tell your body how to move and to fire the right muscles to do so. Overall core strength, balance and even proprioception can improve with beach workouts. Mindset + Outlook – Working out at the beach with beautiful ocean views seriously beats a workout in your local sweat filled gym. There are calming effects of the ocean on the mind and body. It’s a place to exhale. 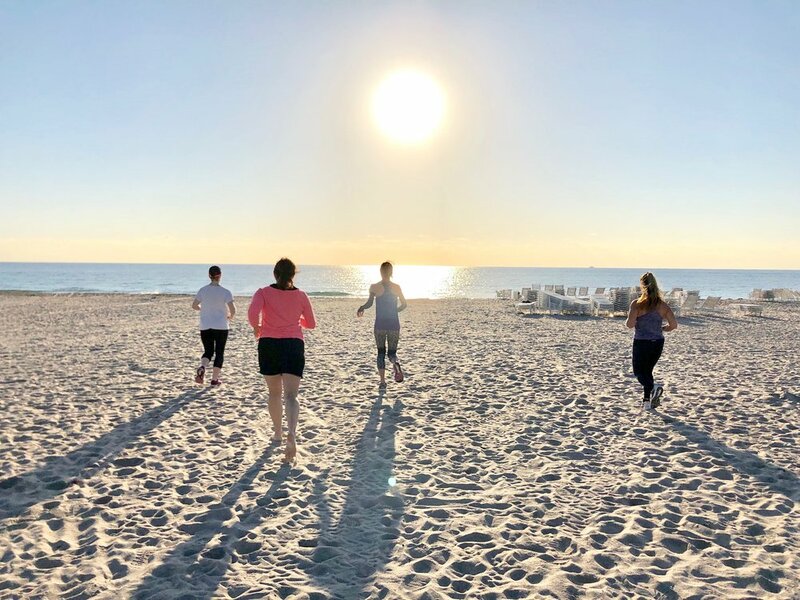 Workout on the beach and get the best of both worlds – a workout to invigorate your body and the atmosphere to calm your mind. We hope you’ll join us for a beach workout! If you have any questions about the classes or how to sign up, please send us an email at retreats@bvretreat.com. We’re happy to help!